Publisher: CIHM/ICMH Microfiche series = CIHM/ICMH collection de microfiches -- no. 04645, CIHM/ICMH microfiche series -- no. 04645. Place: Sainte-Anne de la Pocatière, Québec? "CIHM/ICMH Microfiche series = CIHM/ICMH collection de microfiches -- no. 04645, CIHM/ICMH microfiche series -- no. 04645" serie. 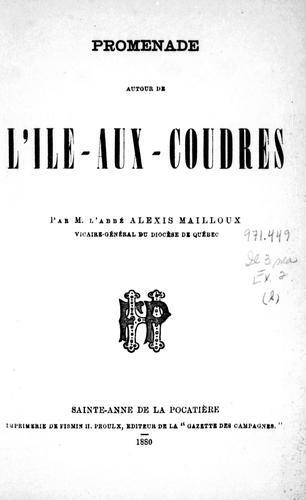 The Free Books Online service executes searching for the e-book "Promenade autour de l’Ile-aux-Coudres" to provide you with the opportunity to download it for free. Click the appropriate button to start searching the book to get it in the format you are interested in.